Is that a dog whistle I hear? Home / Creative / Is that a dog whistle I hear? OMG, a commercial for dogs! I will be the first to admit, I LOVE, LOVE my four legged best friend and tend to spoil him just a tad, but I am not sure what my thoughts are on this. 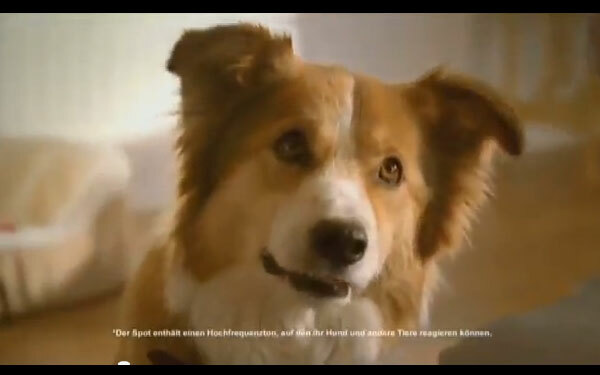 Nestle, one of the world’s largest manufacturers of pet food, has created a 23-second television commercial for dogs! The spot has high pitched whistles that can only be heard by dogs. It is hard for me to picture myself experiencing a commercial with my dog, especially when I can’t hear anything. It is one thing to experience something with my dog if we are walking or playing in the park, but not as much for a tv spot, ESPECIALLY for food. While I would laugh and think it was cute, I wouldn’t just change Bodie’s food because he was drawn to a commercial. Anyone that has a dog knows it isn’t easy to change a dog’s food…it can be hard on their stomach and takes some adjusting. The food we feed him is good for his health and he can’t talk to me to tell me what he wants. I think advertising to the dogs targets the wrong audience.